There are thousands of junior mining companies listed on all the various markets today and each and everyone of these juniors is out there, somewhere on the planet trying to dig up the next big find. However if truth be told, most of these juniors will fail to find anything of any great value. Many of these small companies will end up broke and eventually will be delisted. This is one of the reasons why doing due diligence on small mining companies these days is so important. Your due diligence needs to include several issues. One of the first things I look at is management. Second is location. Next in line would be cash on hand, how many shares outstanding and then the project the company is working on. In this article we are going to take a look at Mammoth Resources. 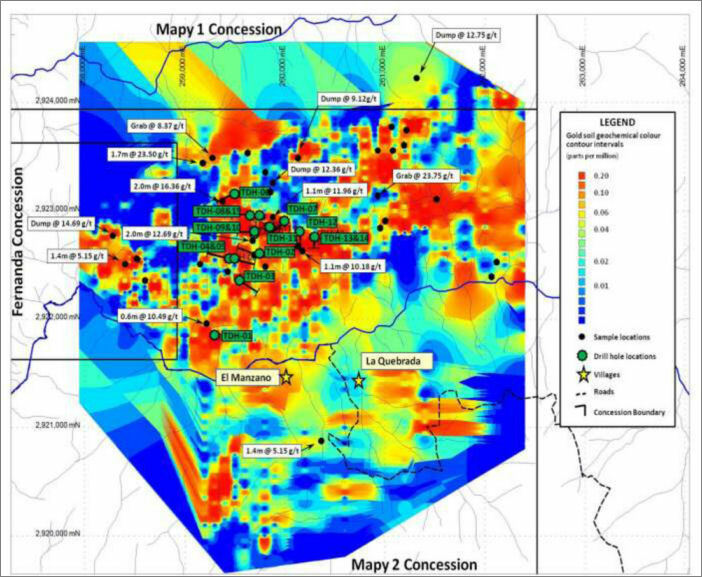 Mammoth Resources is a junior gold and silver explorer that has a PM project in Mexico and trades on the TSX Venture exchange under the ticker MTH. One of the first things that struck a chord with me is the location and the commodity. Personally I tend to lean towards small juniors that are exploring PM's in Mexico and that is because of the permitting and costs of exploration and this is where Mammoth Resources project is located. Mammoth's project, known as the Tenoriba project is located in the heart of the prolific Sierra Madre region in the southwestern Chihuahua State of Mexico. For small junior companies, Mexico has become a "go to" place to explore. According to a report published by SNL Metals & Mining 2015, Mexico is the first destination in mining exploration within Latin America and the fourth worldwide. Since 2003, Mexico's aggregate exploration spending grew faster than the world average moving Mexico from eight to fourth place on the global mining ranks. Much of this growth was attributed to Canadian-based junior exploration companies, making up between 75%-80% of the active explorers in Mexico. Other items that have helped is mining regulations and laws. Newer legislation encourages investments in the sector. The 1993 Mining Law (Ley Minera) opened up new areas to foreign investment previously limited to Mexican financing. Permitting for mines has been simplified and obtaining mining licences are quick. The time typically takes between 6-8 months for a licence to be granted as opposed to North America it can take between 5-10 years. Lower labor cost have also helped with getting a lot of exploration started along with a very moderate weather climate. The Tenoriba property was acquired by the company back in 2012 through a series of cash and stock transactions. This property is comprised of three separate three concessions, named Mapy 1, Mapy 2 and Fernanda. 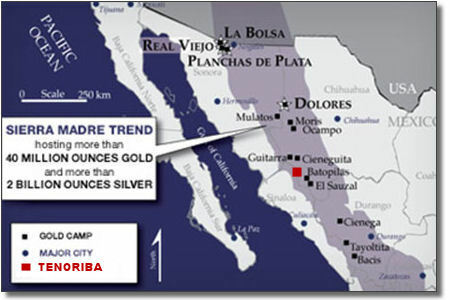 This is an area of high sulphidation, precious metal system which is similar to Goldcorp's El Sauzal mine (3.3 M ounces) and Alamos' Mulatos mine (4.8 M ounces) located in the same Sierra Madre belt. Prior to Mammoth taking control of this property, this land package was optioned and explored by Masuparia Gold. Masuparia Gold spent approximately two million dollars on exploration which included the drilling of 15 drill holes totalling 2500 meters. Masuparia's exploration campaign also included approximately 2000 soil samples, around 90 stream samples and about 680 rock surface samples. All the drill holes tagged mineralization and one drill hole in particular had 3.7 meters grading 5.33 grams per ton and a 1.90 meter section this same drill hole assayed 45.90 grams per ton gold. Mammoth Resources went to the property back in 2013 and started to do follow up work that had been recorded by Masuparia. By focusing on a defined area of approximately 5.0 kilometre by 3.0 kilometres, numerous surface rock samples were collected and after assaying was completed a large proportion of these samples were greater than 5.0 gram per tonne gold and up to as high as 23.50 grams per tonne gold. One of the best samples from this campaign assayed 23.6 grams per tonne gold and 62.1 grams per tonne silver, or 24.84 grams per tonne gold equivalent. The field work to date has confirmed the work of Masuparia's previous exploration, including the presence of a large area covering numerous square kilometres of altered Tertiary felsic volcanics intruded by diorite, quartz monzonitic and quartz feldspar intrusives. Gold grades cover a large portion of this 15 square KM area of property. 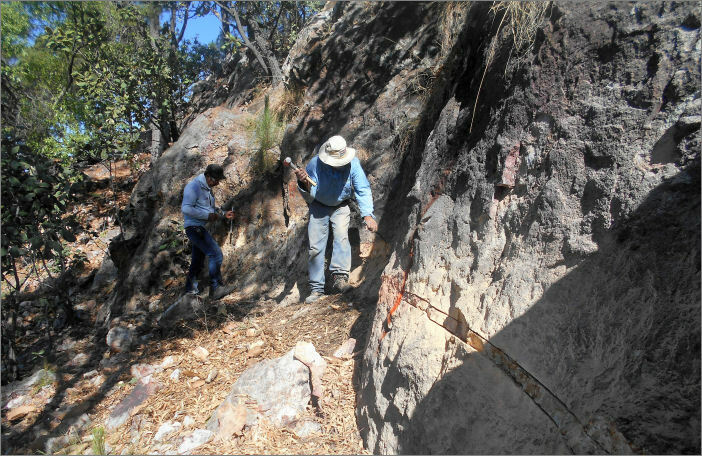 One of areas (Los Carneritos) within this 15 square KM area, measuring 1.5 x 0.7 km saw 74% of 146 rock chip samples collected (115 samples) produced potentially economical grades of gold with silver and averaged 1.56 grams per tonne gold. The highest grade surface sample collected was a 1 x 1 metre sample assaying 74 grams per tonne gold and there are more than 20 samples with grades above 10 g/t gold. Los Carneritos alone given its size could have the potential to host over 1.0 million ounces of gold. As I mentioned earlier, one of the more important issues for due diligence is management. This is where Mammoth Resources has an advantage to other juniors. The company's CEO is Thomas Atkins. Mr. Atkins has 30 years experience in the mineral resource business, including 5 years experience in the field as a geologist working throughout the Americas, 8 years experience as a corporate and investment banker where he underwrote over $1.0 billion in equity, project financings, advised on various acquisitions, business mergers and 7 years experience as a senior executive with two of large cap companies. He was also the President and CEO of Crowflight Minerals and Castlegold. As President and CEO with Crowflight he led the financing and exploration of an extensive regional area nickel project in the Thompson Nickel Belt located Manitoba, Canada. He successfully completed the financing and development of an underground nickel mine. During his three years at Crowflight the company's value increased from $18 million to $350 million. He was also President and CEO of Castle Gold and during his two years at Castle he led the development and expansion of the El Castillo Mine in Mexico which began at 15,000 ounces annual production and increased to 35,000 ounces annual production moving to 75,000 ounces plus a 50% increase in the gold resource. Castle Gold was valued at $30 million and less than two years later and it was taken over by Argonaut Gold (AR.T) for $120 million or $1.25 / share in an all cash transaction. So what does the company have planned for future investors? Because the property already has a valid existing drill permit, the company plans to get to work as soon as possible. This work would include trenching and drill road construction, followed up with a 15 hole, 2,500 m drill program ($500,000 all-in cash cost) to test PIMA survey, geophysics and surface features at depth. The drilling contractor has agreed to shares of the company as payment also and the company is fast forwarding plans for an October 2017 drilling campaign if possible. Today there are thousands of junior mining companies to invest in. With the recent rebound in metals and gold in particular, investor taste for these kinds of investments have turned positive. Prudent and contrairian investors know all too well that these kind of investments run in cycles. Knowing these cycles there is no doubt that the world has seen the bottom of the bear cycle and the time to look at investing in these types of investments is now. Investors who understand this will be active in evaluating companies and projects that have a lot of positives and this is a catagory that Mammoth Resources is in. Here are some good reasons to have Mammoth Resources on your investing radar. To find out more about Mammoth Resources and this project, Click Here to visit their website. There you will find an extensive amount of information along with contact information.